FOR WEBER DCOE AND DELLORTO DHLA. Large investments are made into carburettor and inlet manifold systems. However, to get the best results from your kit, the need for a quality and technically advanced throttle linkage is often overlooked. The new Mangoletsi “Sliding Set-up” linkages provide a system that is aesthetically pleasing. 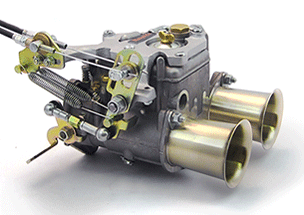 They are low profile and the casting is designed to the shape of the carburettor tops to retain the classic look. The linkages are designed to accept a wide range of pedal movement. The rate of throttle opening and the tension of the twin pull-off springs are adjustable. The linkages are manufactured for competition use, utilising 5 oilite bushes. Comes complete with levers and a spares/service kit and tools. Single and twin cable systems are available. The main restriction is caused by the manifold/head bolts which are common to both the inlet and exhaust manifold – they encroach into the inlet ports. Mangoletsi manifolds are widely used by many leading Mini tuners. We have developed new inlets to give substantially increased flow. The standard Mini inlet is combined with the exhaust manifold and is located to the head with spigot rings. Usually cast inlet manifolds for Webers are bored to fit over the spigot to ensure correct alignment. For high performance engines the spigots are removed, leaving a larger bored port in the head. The port is then opened up into the head for greater flow. Normally, without the spigot, the new manifold has to be dowelled to the head for perfect alignment. Our new Competition manifolds have an outlet port diameter of 34.3mm The new manifold is cored out progressively from 34.3mm to 45mm, and then fully polished for optimum flow. To ensure correct matching, the manifold is machined to the exact head port centres. The two centre half holes are drilled to a tight tolerance to act as dowels. The new manifolds enable greater power and a precise match to the head – saving a very laborious and costly job. Over the past two years Mangoletsi cast inlet manifolds have progressively been re-developed to give greater flow. Most of the manifolds available on the market for classic cars were designed many years ago for 40mm carburettors, and tuners then opened them up to accept 45mm carburettors. This does not give an optimised port diameter from carburettor to head port. Our new 45mm and 48mm Big Bore manifold castings have progressively cored out and optimised port sizes, and are then fully polished.